This weeks SOTW comes from Dr.Os here in the UK, at first glance a 9-3 Aero but as you can see from the picture there are a few differences and they don’t stop there. Read Os’s words below. 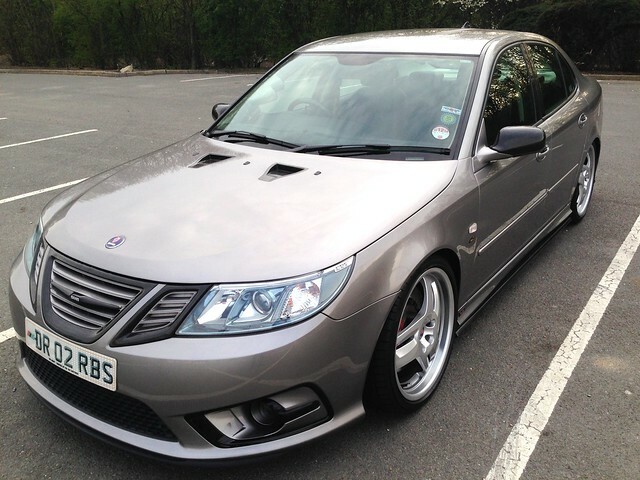 The car is a Saab 9-3 Aero Sports Saloon 2003 model. It has enjoyed only the one owner since new. The performance and visual creations of the car started off in 2007 with a Saab City dealership T9 upgrade package. Since 2007, the car has undergone a complete and extensive metamorphoses, from the factory produced variant into what I lovingly refer to as “The Beast”. Great Western Saabs were once again on display at this years Classic Vehicle Restoration Show in the UK which attracted 6,000 classic and vintage car enthusiasts plus displays and demonstrations from the professional restorers and from clubs. .
GWS had two SAABs on their stand, a ‘pink’ 96 which was to be detailed and returned to it’s original Toreador Red and a MkIII Sonett in bright orange. The Sonnet attracted much interest as many had never seen one before. In fact it attracted so much interest it won an award! ‘The Most Interesting Car of the Show’. It has been a great year for GWS as they also won two awards at the Classic Car Show back in April of this year and ‘Most Admired SAAB’ at the very popular Swedish Day organised by our very own Robin Morley. Swedish Day in the UK has arrived again, and tomorrow for around six hours there will be a gathering of nearly 200 vehicles who have their routes in Swedish. Take a look at the Swedish Day website for more details. Over 60% of them will be Saab with Volvo catching up fast, but this year we have around 14 Swedish Trucks coming along as well, both Scania and Volvo. Sadly no Koenigseggs have been in touch, but maybe one year. Weather forcast is looking good so fingers crossed for a dry sunny show. Many of the French and Belgium visitors are arriving in England as I type and we will all join together tonight for a meal at the local Sparkford Inn, no dout chatting until past closing time. Everyone is welcome to take a visit and we look forward to seeing lots of visitors. A few of last years pictures are at my flickr page. Saab Parts UK gave us this News Release today. THINKING OF SELLING YOUR SAAB?